Easy DIY Halloween Wreath. Perfect to decorate your front door or home during the most spooktacular time of the year! Hi to all of the 36th Avenue fans! I’m Melanie from Artzy Creations and I’m so excited to be sharing another fun craft with you today. I love Halloween… but I especially love decorations for Halloween that you can make in a jiffy and look really great. This just happens to be one of those projects. Being a busy Mom and an Art Teacher, I don’t always have a lot of the time for labor intensive projects, so I really appreciate the ones that come together quickly. So, as you can see here, I’ve come up with a project that requires just a little bit of time and a few supplies, resulting in a fun, and not too creepy DIY Wine Barrel Halloween Wreath. Step 1: Wrap the wine barrel ring with the ribbon and overlap it slightly as you wrap. Hot glue the end in place. 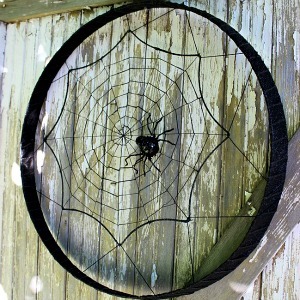 Step 2: Lay the spider web off centered in the wine barrel ring. Lace the cording through and around the spider web to attach it to the ring. Once you are done, secure it to the wine barrel ring by tying a knot and finishing it wit a dab of hot glue. Step 3: Attach your spider and you are done! By using the wine barrel for this wreath, this ends up being a good sized Halloween decoration. Thank you to Desiree for having me!